Q: This week in itself we have seen the Indian markets outperform the rest of the emerging market on the back of the domestic event, the state election verdict in anticipation of a favourable verdict there. If it actually does materialize is there a possibility that Indian markets might outperform the other emerging markets? 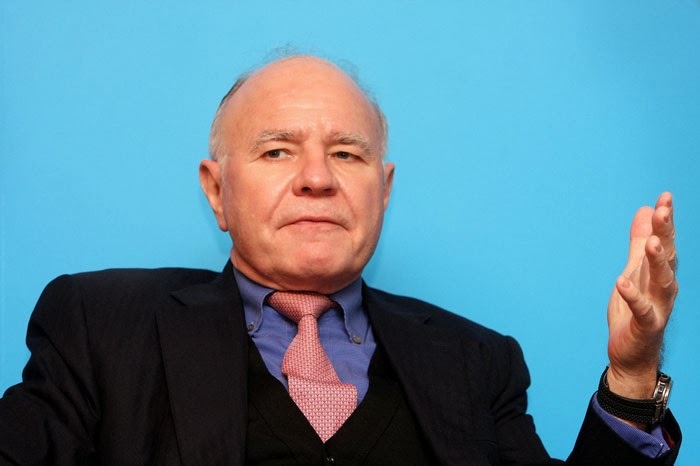 Marc Faber : I just explained to you that the Indian market is still down 40 percent in dollar terms from the 2008 high; whereas other markets like Indonesia, Thailand, Malaysia and Philippines were up until May by about 4 times from the 2009 lows. So we had an underperformance of India compared to other emerging economies until recently. And we have this pool of international liquidity that is driven by asset allocators, so they look at India - they see a relative poor performance and they see some marginal improvement in the macroeconomic environment of India. So money is flowing out of countries like Indonesia, Philippines, Thailand into India.